Welcome to the social media showroom. For millennials, social media is more than a place to check product options. Social media is an integral part of the millennial purchase process. Teen Vogue’s March 2014 “Seeing Social” survey garnered 1,074 responses from young US women (age 13 to 29) regarding the role social media in their beauty and fashion purchase process. 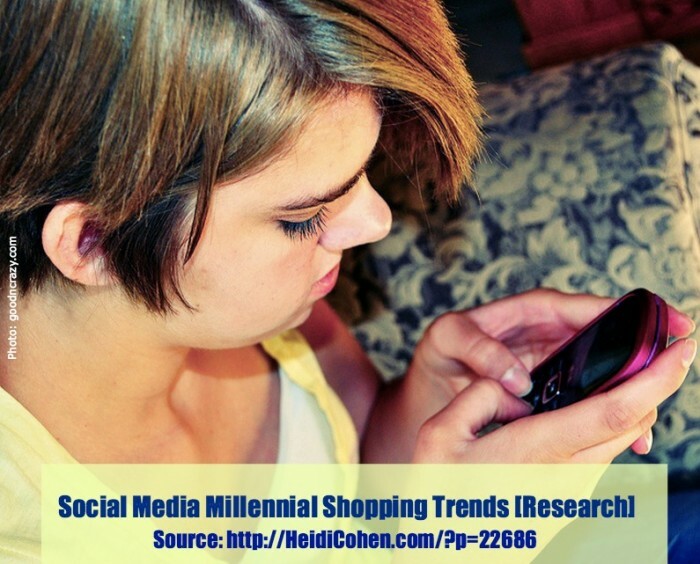 Millennials use social media including social commerce as part of their purchase process. 85% of respondents purchased a product after viewing it on a social media network. 26% of respondents made a purchase directly from a social network. 47% of respondents would like the ability to purchase a product they’ve viewed directly from the network. The social media future belongs to Instagram. If they could only have just ONE social network, these millennials choose Instagram. Further and more importantly for marketers is that Instagram is where millennials turn for purchase inspiration. 52% of respondents searched YouTube videos for how best to wear or apply the product they find a product or brand they like on social media. 48% of respondents found additional product images on Pinterest. Before buying, they comparison shopped on social media platforms. This is consistent with other Pinterest research. 81% of respondents wanted more product sampling. 65% of respondents wanted to know where the closest store is to buy the product they viewed. 56% of respondents wanted more looks and products that make sense based on where they live. Interestingly, despite the popularity of SnapChat and Tumblr among teens and twentysomethings, those platforms didn’t appear on this survey. By contrast, University of Massachusetts Dartmouth’s Fall 2013 research, Millennials Drive Social Commerce, focused on Facebook, Twitter and Pinterest. To ensure that your social media usage is aligned with your key markets, ask your customers. You can do this when creating special insider clubs, monitoring your competitors on social media, and asking customers directly in your stores and via your customer service. What do these social media millennial shopping trends mean for marketers? Here are 5 social media marketing tips to ensure that you reach millennials when they’re shopping on their favorite social networks. 1. Use a mix of social media networks. You need to be present where your audience spends their time. Don’t assume that your key audience is only on Facebook. In fact, many teens are leaving Facebook. Actionable Social Media Marketing Tip: Use Instagram, YouTube, Pinterest and Facebook to reach millennial buyers. 2. Provide prospects and customers with different styling options. Appreciate that your buyers live in a wide variety of locations and have different needs where your products are appropriate. Their lives are NOT one-size-fits-all. Prospects use visual social networks like Instagram and Pinterest as their buying guides. Recently a millennial aged stylist told me that she was surprised that her clients came in wanting the exact same outfits that they found on Pinterest. Social Media Marketing Tip: Show your potential customers the versatility of your products. This applies to more than just the beauty and fashion products used in the survey. At a minimum, portray people using your products in different locations as well as in various situations (such as work, dates, and weekends). 3. Include contact information and ability in your social media profiles. Make it easy for millennial prospects to finish their purchase when they’re ready to buy. Don’t leave it to chance that they’ll seek your business out. By doing this, you allow your competitors the opportunity to jump in and service them. Actionable Social Media Marketing Tip: Give your audience the contact details they want quickly. Phone numbers including the number of your closest retail outlet and phone sales support. Physical address with map capability showing the closest location to where your prospect is when they’re checking and the ability to get easy-to-follow instructions. Link to your website. Of course this option is best if it’s responsive to a variety of devices. Email address to send questions. 4. Plan content distribution by type by social media platform. Leverage the special attributes of each social network to serve your prospects and customers the 5 basic content types where they look for it. This research helps guide your content distribution better. Place product information and styling on Instagram, Pinterest and YouTube. Include ratings and reviews on YouTube as well as more targeted sites. Promote your sales and savings on Facebook. 5. Encourage user-generated content (UGC). Get your customers involved in your social media content on Instagram, Facebook, YouTube and Pinterest. Include messages asking your customers to share their images. Incorporate a tailored call to action on your various social media profiles, in your receipts and purchase emailings, on your website and in your store. Social Media Marketing Tip: Leverage the power of your base to make this customer created content special with a customer of the week emailing or sign in your store. Millennials are social media savvy and they’re applying that to their purchasing. Make sure that you’re present and engaged where they are. Provide them the information that they want, where they want it and when they want it. What has your experience been selling to millennials on social networks? Tags Millennial, Research, Social Media Marketing Tip, Teen Vogue. Bookmark the permalink.